"I shall certainly feel often enough the inducements to Belmont, among the chief of which will be your society and the desire of becoming acquainted with Mrs. Peters. 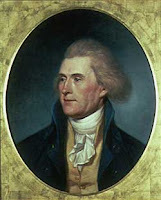 …When Madison returns you will often find him here without notice and always with it: and if you complain again of not seeing him, it will be that the place of rendezvous does not enjoy your favour." William Peters (1702-1786), Richard's father, built "Belmont" which overlooked Philadelphia in 1745. A lawyer interested in experimenting in agricultural techniques, Peters developed elaborate grounds at his country home. Richard Jr. (1780-1848) was the fourth reporter of the Supreme Court until replaced by Benjamin Chew Howard (1791-1872), son of RevWar hero Col. John Eager Howard of Baltimore and grandson of Benjamin Chew of "Cliveden" near Philadelphia. 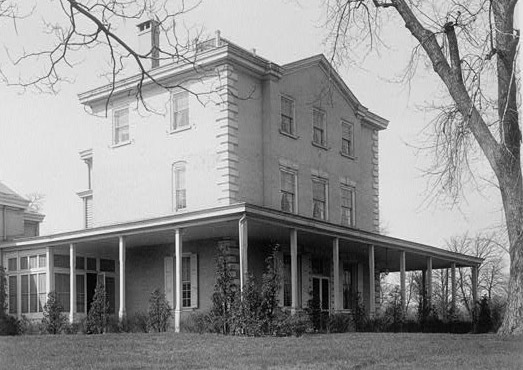 In 1869 "Belmont" was taken by the city and became part of Fairmount Park. "After a while passed through a covered passage to the large hall well furnished, the top adorned with instruments of music, coats of arms, crests and other ornaments in stucco, its sides by paintings and statues in bronze. From the front of this hall you have a prospect bounded by the Jerseys like a blue ridge. A broad walk of English Cherry trees leads down to the river. The doors of the house opening opposite admit a prospect of the length of the garden over a broad gravel walk to a large handsome summer house on a green. From the windows a vista is terminated by an obelisk. On the right you enter a labyrinth of hedge of low cedar and spruce. In the middle stands a statue of Apollo. In the garden are statues of Diana, Fame and Mercury with urns. We left the garden for a wood cut into vistas. In the midst is a Chinese temple for a summer house. One avenue gives a fine prospect of the City. With a spy glass you discern the houses and hospital distinctly. Another avenue looks to the obelisk." Famous Old Receipts Used a Hundred Years and More in the Kitchens of the North and The South, Contributed by Descendants compiled by Jacqueline Harrison Smith. 2d Phila: John C. Winston Co., 1908. Other sources say it is from a letter in the Historical Society of PA. The Callender quote from The Pennsylvania Magazine of History and Biography, 1888 is from the diary of Hannah Callender Sansom (diary covers 1758-1788). The painting by Peale is also from 1791 when Jefferson was Secretary of State in Philadelphia. It is in the National Portrait Gallery.